Our Patient Rewards Program is implanted to encourage patient compliance throughout their treatment. 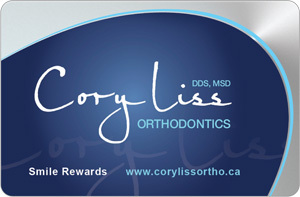 You will be given one of a swipe rewards cards and a Cory Liss Orthodontics Lanyard. At each appointment, you will be awarded for cooperation & commitment to your treatment. You must have your card with you at your visit to get your points. You will earn extra points for wearing your lanyard to your appointment. possibilities for earning rewards points and the prizes you can redeem those points for. When Do the Program End? Your rewards card is yours to keep; you can earn rewards points even if your treatment has been completed. The fun never ends; follow us on facebook for office happenings and log in by clicking on the rewards card for ways to earn rewards points. Our rewards card is handy and easy to use but should you lose or damage your card, you will have to redeem some of your rewards points to replace it. Replacement cards are 25 points, so take good care of your card, and you can use your points for prizes instead. Points can be redeemed for great prizes, just click on the card above! Enter your 16-digit membership number or username on the back of your card and your 4-digit password and enter into the Cory Liss Orthodontics world of FUN!